This #236 35 Pc. 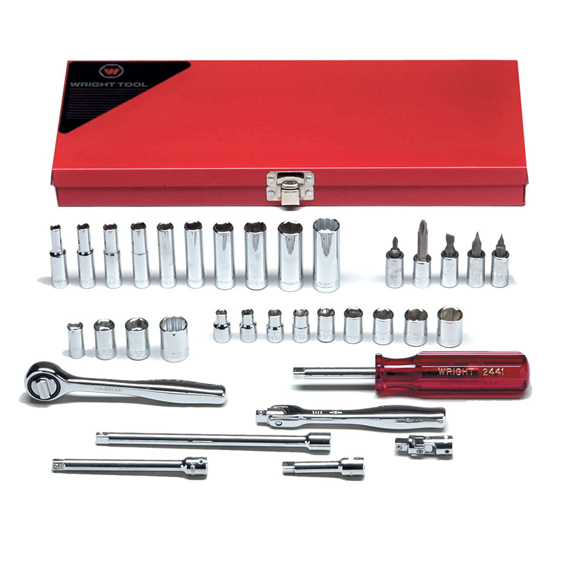 1/4" Drive Socket & Screwdriver Bit Set from Wright Tool includes a wide variety of socket types and sizes, and accessories to meet many work requirements. The superior Wright Drive design distributes contact stress more effectively than any other wrench system. With the stress spread over a larger contact area and away from the corners, Wright Drive improves fastener torque load while decreasing rounding and distortion of the fastener. 10x more contact than conventional 12-point designs. 1.7x more contact than 2nd generation AS954 12-point.